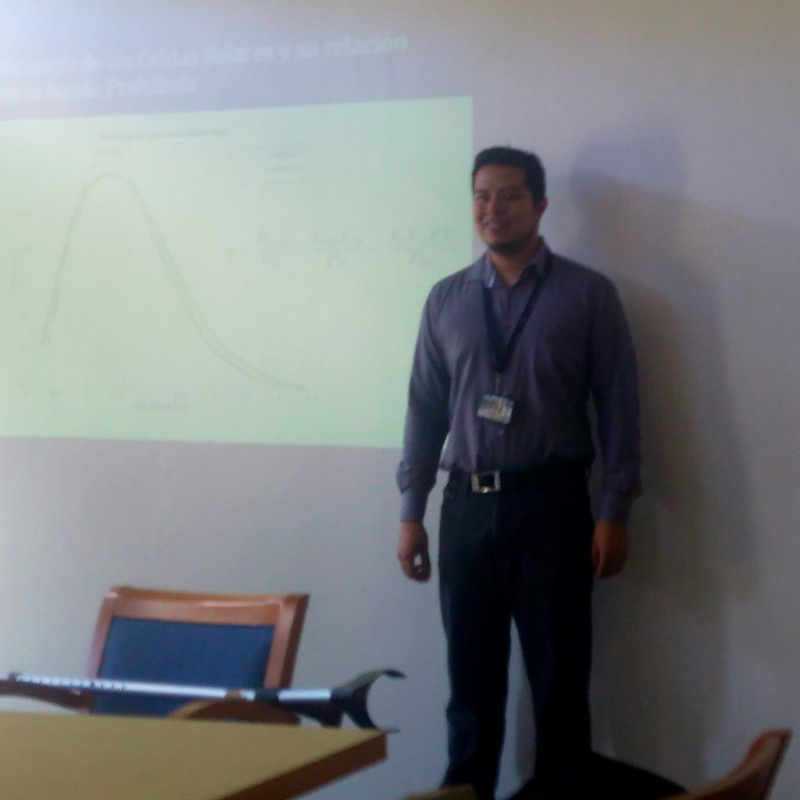 On Thursday December 7, 2017 took place the first Workshop on technologies, trends, and prospects of renewable energy projects, at Universidad Simón Bolívar, Caracas, Venezuela. The event consisted in a series of four seminars related to ongoing research and practical challenges in the topic of renewable energy. 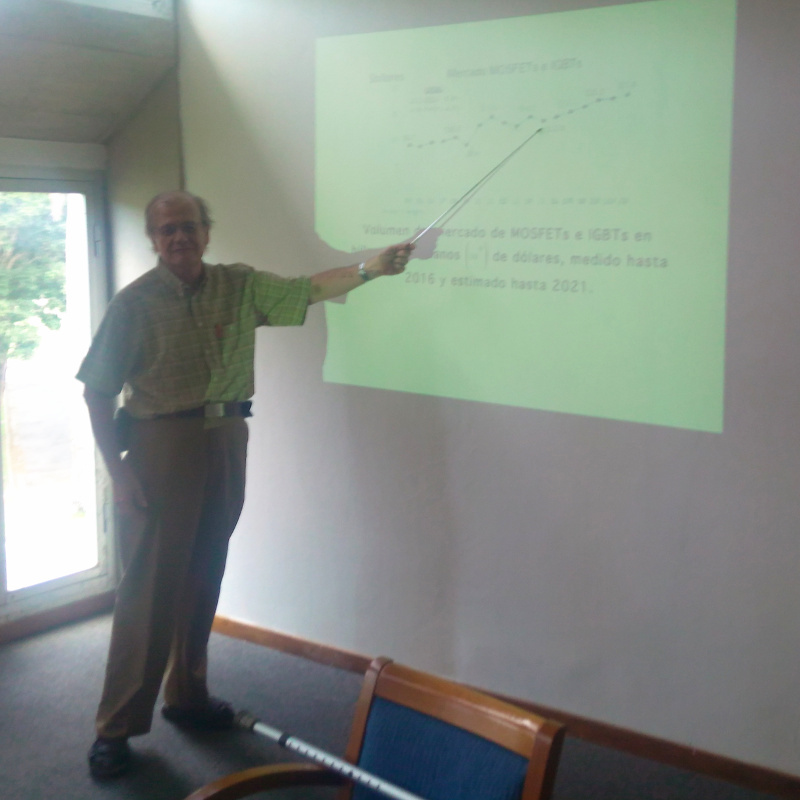 The first tutorial was in charge of Professor Orlando Trejo, with a lecture titled “Dependence of the Conversion Efficiency of PV Cells with the Manufacturing Semiconductor Band Gap”. 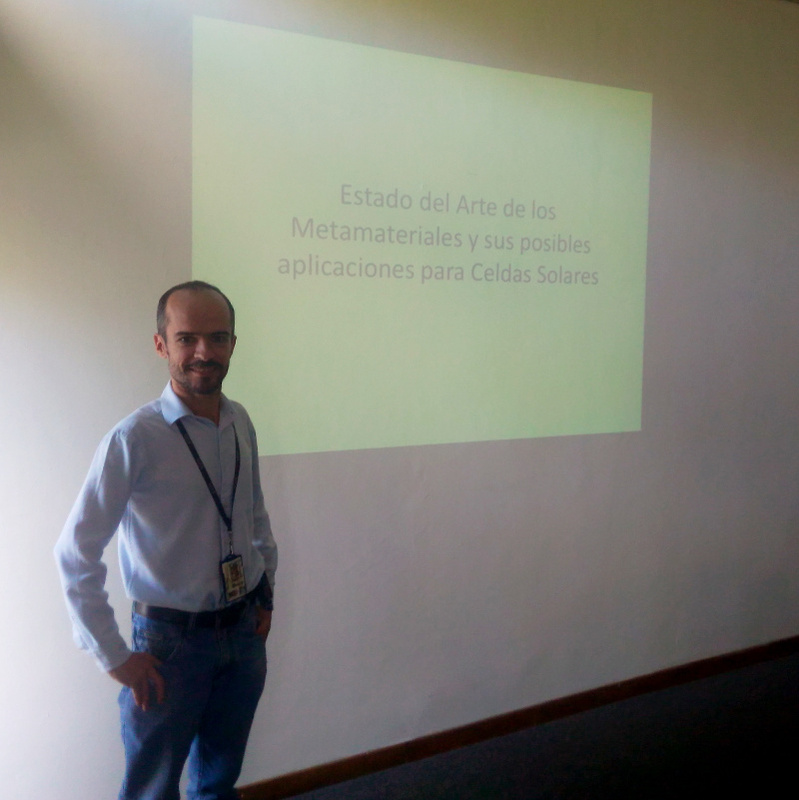 Next, Professor Raúl Barroso presented his lecture “Potential of Metamaterials in Solar PV Cell Fabrication”, and was followed by Professor Víctor Guzmán with his tutorial titled “Power Electronics in Renewable Energy Applications”. 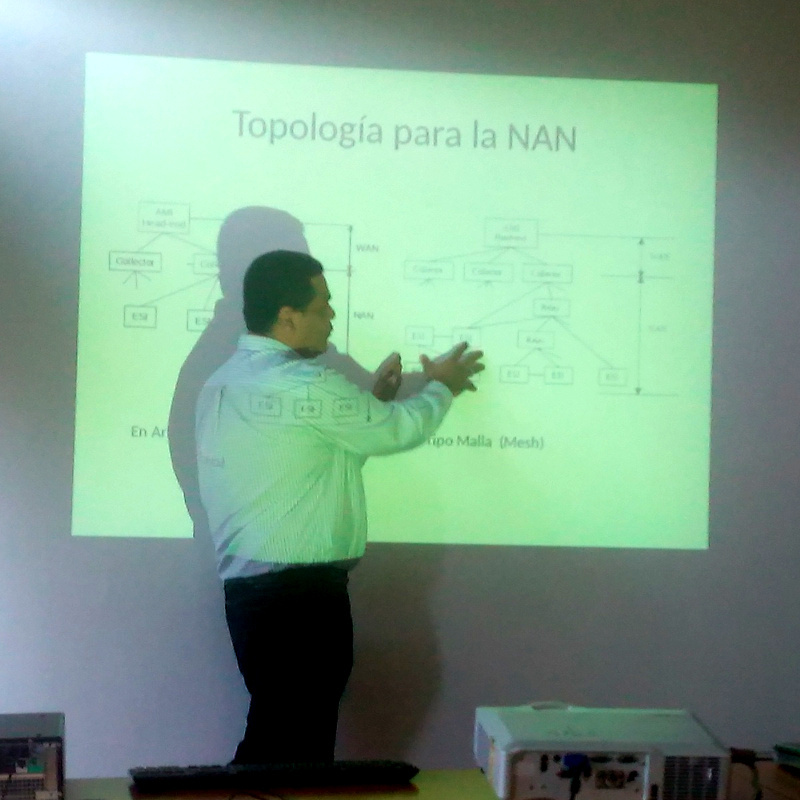 Finally, Professor Miguel Díaz closed the session with his presentation: “Communication Systems for Smart Grids”. 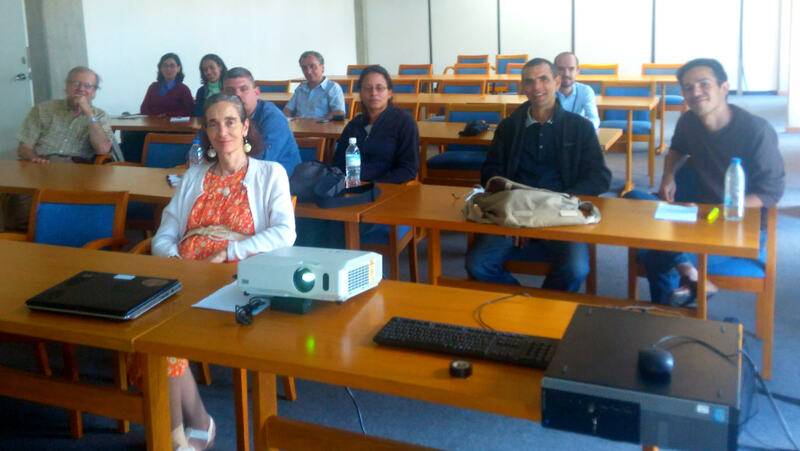 The audience included professionals from multiple disciplines and institutions from Venezuela, who engaged in dynamic discussions with the presenters. The informal meetings after the conclusion of the workshop served as a starting point for further collaboration, aiming to integrate expertise from multiple fields to tackle current challenges relevant to renewable energy technology. 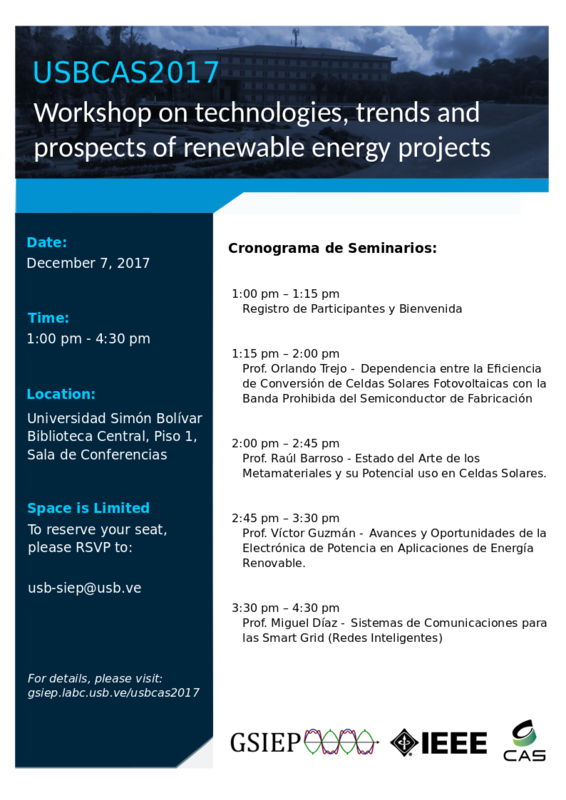 The Industrial Power Electronics Research Group (GSIEP-USB) and the IEEE Circuits and Systems Society (CAS-IEEE) invites researchers, entrepreneurs, industry representatives and general public to the first Workshop on technologies, trends and prospects of renewable energy projects, which will take place on December 7, 2017 at the beautiful campus of Universidad Simón Bolívar in Caracas, Venezuela. This event will consist in a series of seminars, tutorials and presentation of ongoing research projects related to trends and challenges of electrical systems for energy production using renewable sources. The venue will serve as a meeting point for academic, industrial and general community to assess the opportunities and potential of the development of renewable energy projects in a local and international scope. Electrical circuits and systems for energy generation. Smart grid and IoT solutions for grid operation and control. Modeling of Solar PV, Solar thermal and wind energy systems. Feasibility studies of renewable energy projects in Latin-america. Proposals of related topics not listed are also welcome. To submit your tutorial, seminar or talk proposal, send an e-mail with a one page abstract of no more than 400 words to: usb-siep@usb.ve , with the subject [USBCAS2017 “Proposal”]. Submissions are accepted in Spanish or English. Please include a brief bio of the author (up to 60 words). Submission of proposals are due November 28. To reserve your seat as attendee, please send an e-mail to: usb-siep@usb.ve with your full name and institution of affiliation. Seat availability is limited. December 7 2017, Universidad Simón Bolívar, Biblioteca Principal, Planta Baja, Sala Rosario Horowitz, 1:00 pm – 4:30 pm.